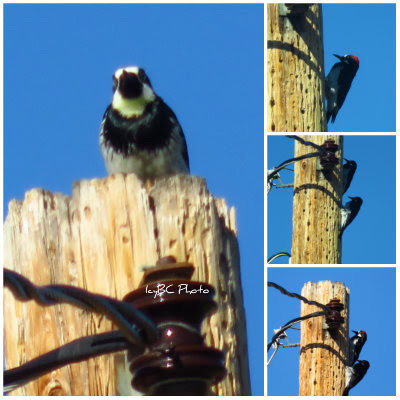 What I found amazing is that these acorn woodpeckers live like a colony on either the electrical pole or on the palm tree. I couldn't take a photo of their gathering as my camera could reach that far up or high up. 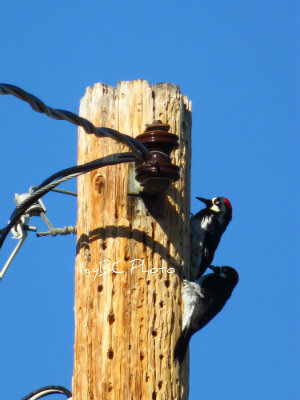 nice capture of these woodpeckers! Icy I posted my <a href="http://cmlk79.blogspot.ca/2016/02/sunday-sketches-pelican.html> pelican </a> drawing today, thx. I envy you so much for seeing them. I've never heard of these woodpeckers before. Great stuff. Nice photos of these great birds. These are the only woodpeckers we see down here. They are total characters (as well as being pretty). They make holes in trees, houses, or whatever. Then they force acorns into the holes. As you can imagine, this causes an ongoing turf war between the them and the squirrels. Sometimes, they will put thousands of acorns into the trunk of a large tree. Occasionally, we even seen them working on palm trees.